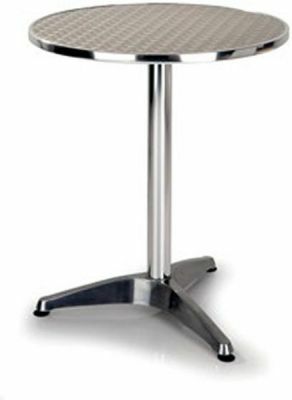 Aluminium table with a 60mm diameter top and 3 leg base. Available from stock for a fats and free delivery. Suitable for outdoor use and easy to assemble. Hard wearing and suitable for use in an outdoor cafe area. Outdoor aluminium table and base suitable for commercial use. This café table is on a 2-3 day lead time and requires assembly. These café tables are suitable for outdoor use.